The Vocal Toning MP3 Library is now only available on the Patreon page. Many of the MP3’s are public. Some require contributions of at least $1 for access which includes other exclusive content too. MP3’s from the Vocal Toning Meditation Level One: Foundations CD are not yet available, but will eventually be made available to those contributing $5. Thanks for your appreciation. Would you like to learn more? 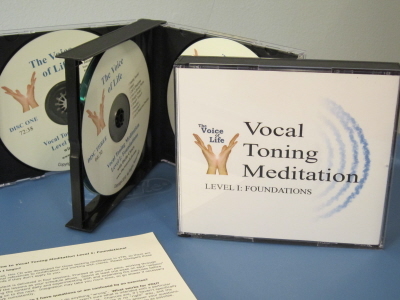 You can order Vocal Toning Meditation Foundations: Level I from CD Baby as a download here. Buy a la carte or the complete program which was originally part of a 4-CD set. It is jam-packed and designed to give the listener a foundational understanding of vibrational science, basic vocal warm-ups, and the art of toning and sounding vocally. Intro to Sound Healing; Physical Warmups; Breath Work, Vocal Warmups; Vowels & Syllables; Vocal Variables Part I; Toning Methods: Fundamentals of VTM, Sanskrit Seed Syllables, Tibetan Syllables, Daoist Tones, Call & Response; Feeling & Listening; Voice Care.